For the Irish soldier born in 1920, see Christopher O'Dowd. Christopher O'Dowd (born 9 October 1979) is an Irish actor and comedian, best known for his television roles such as Miles Daly in the Epix comedy series Get Shorty and Roy Trenneman in the Channel 4 comedy The IT Crowd. O'Dowd created and starred in the Sky 1 television series Moone Boy, which aired between 2012 and 2015, earning O'Dowd Irish Film and Television Award nominations in acting, writing and directing. He had a recurring role on the comedy-drama series Girls. O'Dowd is also known for his film roles, including Bridesmaids (2011), This Is 40 (2012), The Sapphires (2012), Thor: The Dark World (2013), Calvary (2014), and St. Vincent (2014). He made his Broadway debut in the play adaptation of Of Mice and Men in 2014, for which he was nominated for a Tony Award. O'Dowd was born and raised in Boyle, County Roscommon. His father, Seán, is a sign designer, and his mother, Denise, is a counsellor and psychotherapist. He is the youngest of five siblings. He represented Roscommon in Gaelic football at the under-16, minor and under-21 levels, the highlight being his performance as a goalkeeper in the 1997 Connacht Minor final against Mayo, in a game covered by RTÉ Sport for highlights on its The Sunday Game programme. He studied politics and sociology at University College Dublin (UCD), and subsequently attended the London Academy of Music and Dramatic Art. O'Dowd did not obtain a degree from UCD, telling the UCD student newspaper the College Tribune: "I didn't finish my degree. The politics part of it was fine, but I was doing sociology as well and I could never bring myself to find an interest in it." He contributed to The University Observer, Ógra Fianna Fáil and was active in UCD Dramsoc and the Literary and Historical Society. O'Dowd was an avid member of Ógra Fianna Fáil and engaged in promotional canvassing for the party amongst UCD's student populace, it was during this time he coined the slogan 'Vote Young Fianna Fáil, for hurling in the halls'. The slogan was a huge success due to O'Dowd's improvisation with classmate Ronan Kirby's hurley. O'Dowd said in The College Tribune that he was personally thanked by Éamon de Valera's ghost in a dream. O'Dowd starred in the United Kingdom in Channel 4's comedy The IT Crowd, BBC Two's Roman's Empire, Red Cap and the award-winning documentary-drama The Year London Blew Up. He has also appeared on Irish television, having starred in the RTÉ One drama The Clinic and the drama Showbands alongside Kerry Katona. O'Dowd has appeared in How to Lose Friends & Alienate People in a minor role. O'Dowd has also had roles in a number of films, including the 2005 film Festival where he played stand-up comedian Tommy O'Dwyer, a role for which he won a Scottish BAFTA award, and a small role in Vera Drake. O'Dowd appears in Frequently Asked Questions About Time Travel, a comedy sci-fiction film with Marc Wootton, Dean Lennox Kelly and Anna Faris. He played Liam in the 2007 German film Hotel Very Welcome. He starred in the 2009 film The Boat That Rocked, released in Canada and the U.S. as Pirate Radio. The film was inspired by the story of offshore pirate broadcasters Radio Caroline. O'Dowd plays Simon, the station's breakfast DJ. "The breakfast jock on Radio Caroline at the time was Tony Blackburn, so there's definitely an element of him in it," says O'Dowd of his character. "And then I called in different Irish DJs that would have been contemporaries of Tony Blackburn at the time, a guy called Larry Gogan and a couple of other people." O'Dowd starred opposite Sienna Miller in the film Hippie Hippie Shake, which is about the groundbreaking '60s magazine, Oz. The publication was the precursor to a whole generation of lad mags. O'Dowd plays Felix Dennis, who would later become the publisher of Maxim. The story centres on the landmark indecency trial. In preparation for the role, O'Dowd met with Dennis, stating "He was an incredibly charismatic man." In April 2009 it was announced that O'Dowd had been cast in a remake of Gulliver's Travels as General Edward. "It's shooting in Pinewood from the end of April", he said, shortly after his participation was announced. "I'm just going back to England to learn how to ride a horse... I'm a general in the army, so there's going to be a little bit of horse riding. I think it's going to be really fun though, we're all kind of learning together." O'Dowd appeared in the 2010 film Dinner for Schmucks, an American version of the French farce, Le Dîner de Cons. He also appeared on panel show Never Mind the Buzzcocks (Season 21, episode 11), and starred in an ITV2 comedy series entitled FM. In 2010, he took part in Little Crackers, writing and directing a short film loosely based on his own childhood and Christmas in his family home from 1984–88. In April 2011, he starred in the BBC adaptation of The Crimson Petal and the White as William Rackham and appeared in the May 2011 release Bridesmaids as Officer Nathan Rhodes. O'Dowd had a supporting role in This Is 40. He described "fighting over Megan Fox in a pool" during filming as "one of the most fun things I've ever done". O'Dowd played Dave in Wayne Blair's 2012 debut feature Australian musical The Sapphires. Based on a popular stage show, it was shot across Australia and Vietnam and produced by Goalpost Australia. He is to write and executive produce a new American comedy series called Big Men, after NBC won the bidding war for it. He co-wrote a series based on his childhood called Moone Boy for Sky 1. Segments of the series, which ran from 2012 to 2015, were filmed in his hometown, Boyle. A book based on the series and also co-written by O'Dowd, Moone Boy: The Blunder Years, was published in May 2015. Subsequent releases include Moone Boy: The Fish Detective, published in October 2015, Moone Boy: The Notion Potion, published in September 2017, as well as an activity book, Moone Boy: The Marvellous Activity Manual, published in May 2017. From April to July, 2014, O'Dowd starred in the Broadway revival of Of Mice and Men, directed by Anna D. Shapiro and co-starring James Franco and Leighton Meester. For this, he was nominated for a Drama Desk and Tony Award for Best Actor in a Play. He starred as a Catholic school teacher in the 2014 film St. Vincent with Bill Murray and Melissa McCarthy. O'Dowd was the narrator for the 2014 RTÉ documentary Man on Bridge. O'Dowd married Scottish writer, director, and television presenter Dawn Porter in 2012. After their marriage, Dawn changed her surname to O'Porter. Despite being raised in a Roman Catholic family, O'Dowd has been a lifelong atheist, and has developed an antitheist philosophy as he has aged. He has stated that religion is "going to be like racism". In April 2014, O'Dowd presented at Broadway Cares/Equity Fights AIDS Easter Bonnet Competition with Leighton Meester and James Franco, after raising donations at his Broadway show Of Mice and Men. On 1 February 2015, it was announced on Twitter that O'Porter gave birth to a son they named Arthur "Art" O'Porter a week earlier. On 1 July 2017, O'Porter gave birth to their second son, Valentine. 2003 Red Cap Bernie Maddox Episode: "Crush"
Doc Martin Jonathan Crozier Episode: "On the Edge"
2010 Little Crackers Himself / Santa Claus Episode: "Chris O'Dowd's Little Cracker: Capturing Santa"
The Twilight Zone Episode: "The Blue Scorpion"
^ "Chris O'Dowd". TV.com. Retrieved 9 May 2014. 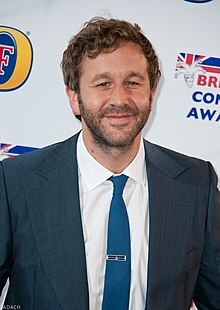 ^ "Chris O'Dowd biography and filmography". Tribute. Retrieved 9 May 2014. ^ Laura Barton (16 June 2011). "Chris O'Dowd: From cult IT geek to Hollywood antihero". London Evening Standard. ^ Stuart Husband (20 June 2011). "Chris O'Dowd Interview". The Daily Telegraph. London. Retrieved 19 October 2012. ^ "Boyle: Boyle actor in television debut". The Sligo Champion. 8 January 2003. ^ Hadley Freeman. "Chris O'Dowd: from The IT Crowd to Hollywood". The Guardian. London. Retrieved 4 December 2015. ^ "Farm - Farming - Roscommon's IT guy". Farmersjournal.ie. Archived from the original on 12 April 2013. Retrieved 4 October 2013. ^ a b c Donie O'Sullivan (4 April 2012). "Standing out from the Crowd". College Tribune. Retrieved 19 October 2012. ^ a b c d Nicole Powers (9 May 2009). "Chris O'Dowd: The IT Man From The IT Crowd". SuicideGirls. Retrieved 19 October 2012. ^ "Chris O'Dowd Interview". Sky TV. Archived from the original on 18 December 2010. ^ "Chris O'Dowd for Knocked Up sequel". RTÉ Ten. 8 June 2011. ^ "'IT Crowd' star to join 'Knocked Up' spin-off". NME. 8 June 2011. ^ "O'Dowd joins Knocked Up spin-off". The Belfast Telegraph. 8 June 2011. 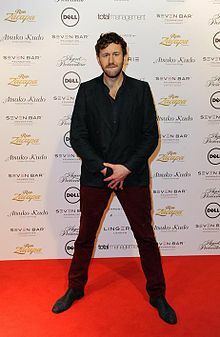 ^ "Chris O'Dowd Joins Aussie Musical 'The Sapphires'". IFTN. 16 August 2011. ^ "On location and finally acting the part". The Sydney Morning Herald. 8 October 2011. ^ "O'Dowd heads to Vietnam for new movie". RTÉ Ten. 16 August 2011. ^ "O'Dowd set for US comedy series". RTÉ Ten. 27 October 2011. ^ Daniel Frankel (26 October 2011). "NBC Wins Bidding War for Chris O'Dowd Comedy 'Big Men'". Reuters. ^ Caroline Crawford (26 November 2011). "O'Dowd hunts twins for his new TV series". Evening Herald. ^ Of Mice and Men Archived 23 February 2014 at the Wayback Machine, playbill.com; accessed 25 April 2014. ^ "January baby! Chris O'Dowd's father reveals his baby with Dawn O'Porter is due early next year". evoke.ie. 22 October 2014. ^ "Actor Chris O'Dowd says religion is 'unacceptable'". The Sydney Morning Herald. ^ "Bryan Cranston, James Franco, Idina Menzel, and More in Highlights From the 2014 Easter Bonnet Competition". TheaterMania.com. 23 April 2014. ^ "'It's a boy!' Chris O'Dowd and Dawn O'Porter announce birth of son Art and joke 'I think we'll keep him'". evoke.ie. 2 February 2015. This page is based on the Wikipedia article Chris O'Dowd; it is used under the Creative Commons Attribution-ShareAlike 3.0 Unported License (CC-BY-SA). You may redistribute it, verbatim or modified, providing that you comply with the terms of the CC-BY-SA.